Reed Hranac presents at 2nd Internation Symposium on Infectious Diseases of Bats in Fort Collins Colorado. 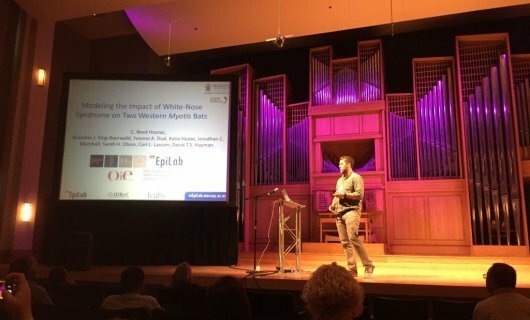 PhD student Reed Hranac has recently returned from Fort Collins Colorado after presenting at talk entitled, Modeling the impact of White-nose syndrome on two species of Western bats. The conference was the 2nd Internation Symposium on Infectious Diseases of Bats in Fort Collins Co from June 29th-July 1st. Emerging infectious diseases have increasingly been associated with bats and this conference allowed for a cross-sectional glimpse at projects underway in the global research community. The breadth of research presented at this conference was vast, from immunology to the value of body scoring. The novel approaches taken by investigators could help any of our IDREC groups. Additionally, the meeting provided for great networking opportunities including groups from South Africa, and Singapore, and the United States.